The Professional Regulation Commission (PRC) already released the results of May 2014 NLE. Pursuant to PRC Resolution No. 2004-223 dated July 19, 2004, results of examinations are final and request for reconsideration of failing grades is not allowed. 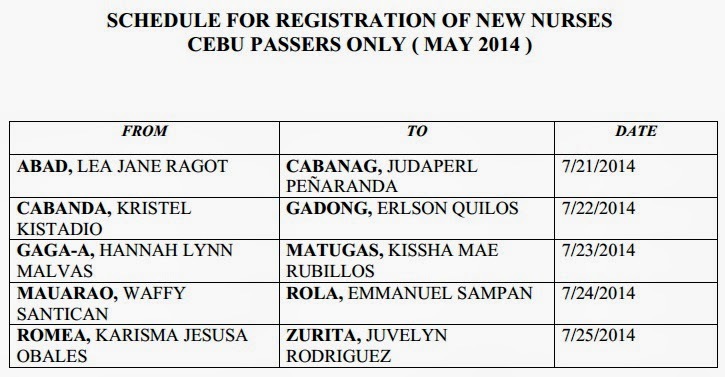 Nursing board exam passers next tasks now is to register, take oath and exercise nursing profession. Information regarding registration, oathtaking schedule, requirements and venue and verification of ratings (VOR) are all available here as we update this site with details from reliable sources. Manila - Schedule of initial registration was announced already. View here. Successful examinees should personally register and sign in the Roster of Registered Professionals, PRC advised. PRC Baguio - Registration starts on Monday, July 7, 2014. To decongest the Regional Office and to enable passers to save on travel time and expenses, the Regional Office will process initial registration outside of Baguio City. PRC Lucena - PRC Lucena has released schedule of mobile services. On Monday, July 7, 2014, PRC will conduct Initial Registration for board passers (any Board Licensure Examination) at Mindoro State University- Calapan City, Oriental Mindoro. On July 12, PRC on Wheels will be at LGU-Tagkawayan, Quezon to conduct Initial Registration for Board Passers. On August 4, PRC will administer mobile services at LGU - Victoria, Oriental Mindoro. For more information, you may visit PRC Lucena Regional Office at 2/F LUCENA GRAND CENTRAL TERMINAL, INC., BRGY. ILAYANG DUPAY or call Telephone No. +(6342) 373.7316 or email prc.lucena@gmail.com / contactprclucena@gmail.com. PRC Cebu - REGISTRATION is done on scheduled date at PRC- CEBU located at HVG ARCADE, Subangdaku, Mandaue City. You may get your oath form at the PRC Office or you can download it. You may secure the requirements INSIDE the PRC OFFICE. You can file your certificate of passing / board rating on your scheduled date. For those who missed to register on their scheduled date, please register starting July 28, 2014 onwards. Requirements: TO ALL PASSERS, please bring your NSO birth certificate ( original ) and a photocopy of the same, a photocopy of your Nursing Application Form ( NAF ) and the photocopy of your PERMANENT EXAMINATION REGISTRATION RECORD CARD ( PERRC ). PRC Zamboanga - All REGISTRANTS are STRICTLY advised to follow the said schedule and time. Community Tax Receipt (CTC) 2014. REGISTRATION TIME will be from 8:00am –11:00am and resume at 1:00pm-4:00pm only. For those REGISTRANTS who were not able to register within the given schedule, you may register after July 21, 2014 onwards. Pay Initial Registration Fee of Php 600.00 and Annual Registration Fee of Php 450.00 for 2014-2017. PRC said that Pursuant to Section 16, of Republic Act No. 9173, “all successful candidates in the examination shall be required to take an oath of professional before the Board or any government official authorized to administer oaths prior to entering upon the nursing practice”. PRC Baguio - Oathtaking ceremony is tentatively scheduled on August 9, 2014 (Saturday) at the Prince Bernhard Hall, Saint Louis University, Baguio City, 9:00 AM to 12:00 NN. 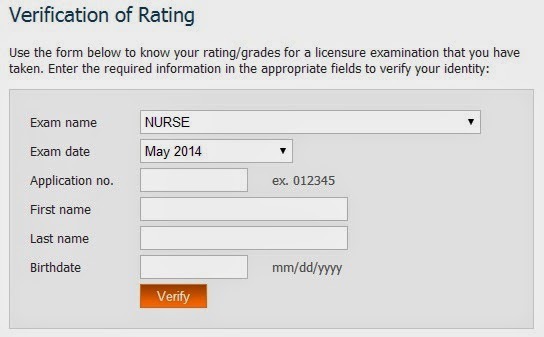 Through Verification of Ratings (VoR) online on PRC website, May 2014 NLE takers will be able to check grades by entering the required information in the appropriate fields. Some of the required information includes application number and birthdate. VOR for May 2014 NLE is now available. Check your ratings now. To receive regular updates on NLE-related contents, we encourage you to bookmark this page or Share Now this article on social networks (Facebook and Twitter). Follow us via RSS Feeds.